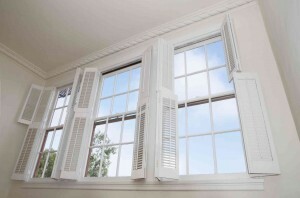 Upgrade to energy efficient windows this spring! When it comes time to replace your windows, it’s often because the old ones have broken, clouded, or ruining the curb appeal of your home. The process of replacing the windows is actually pretty simple, but it is time-consuming. It also is sometimes expensive, so it’s tempting to try to go as cheap as possible with the windows. Energy efficient windows often cost more than standard windows, but they also offer great benefits that make the cost worthwhile. Energy efficient windows will keep your home more comfortable by insulating it from the outside weather. No more cold air leaking in when the wind blows and no more hot spots in the room during the heat of the summer. They are actually so good at insulating that you may find that your home stays comfortable without AC for far longer than it used to. Improved insulation of your home through energy efficient upgrades means less heating and cooling, and this translates directly to more money in your pockets. While these windows are more expensive upfront, you will find that they are a home improvement project that pays for itself in decreased energy costs over time. The great insulating qualities of energy efficient windows that help them keep out cold air, also allows them to insulate against sounds. If you live near a big road, railroad tracks, or simply close to nice but noisy neighbors, this can be a huge side benefit to upgrading your windows. Energy efficient windows are coated to block UV rays. And the UV protection is not just about protecting your skin (and health). UV rays can actually also damage the interior of your home, by fading woodwork, upholstery, furniture, and even artworks. High quality, energy efficient windows filter out up to 98% of that damaging UV energy though, so it’s not an issue you’ll have to worry about. Energy efficient windows are a green choice, not because of the green they save you in energy costs but because of their environmental impact. By helping you use less energy to keep your home comfortable, these windows will help decrease fuel consumption and lower your carbon footprint. This entry was posted on Friday, April 5th, 2019	at 11:40 am	. You can follow any responses to this entry through the RSS 2.0	feed. Both comments and pings are currently closed.